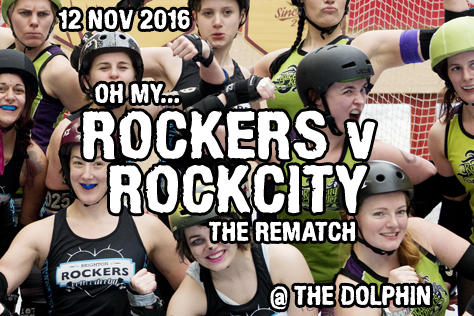 ROCKCITY REMATCH: This SATURDAY the BRIGHTON ROCKERS take on EINDHOVEN and most of HAMPSHIRE! There’s a whole bunch of Brighton Rockers action coming up in Sussex (and neighbouring Hampshire) over the next few weeks. Things kick off this Saturday (12th Nov) as the A-team AllStars take on Rockcity Rollers from the Dutch city of Eindhoven. This is a rematch of a game that took place in February in Normandy, with Brighton looking to reverse a narrow 167-140 loss this time out. The day also features the Brighton B-team Rockerbillies taking on an ungodly hybrid of the Basingstoke Bullets and Southampton City Rollers. Five or six Class of 2016 Fresh Meat graduates will be making their debuts in the B-team game, while the AllStars match is the final game (for a while at least) for Rockers stars Gin Atomic and Lab Wrath. Go buy all the tickets now, yeah? Saturday’s action takes place in the Rockers regular open door venue, the Dolphin Leisure Centre in Haywards Heath. Doors are at 2pm, with the derby kicking off around 2.30 – we presume the A-team game is first up (they usually are). Tickets priced £10 adults, £8 students and free for under 12s are available from the link below. There’s a special 4-for-3 deal on adult tickets. The venue is around seven minutes walk from Haywards Heath station (turn left and follow the signs) at postcode RH16 1LY. There’s a cafe, bar and vending machines there, and the nearest cashpoint is at the big Sainsbury’s halfway between the station and venue. The pub opposite the station (Burrell Arms) is OK for a pre-game pint, but beer geeks might want to know that Haywards now has a Dark Star pub – the Lockhart Tavern opened on Broadway last Wednesday. Don’t forget to pick up a free copy of our fanzine Turn Left at the games. 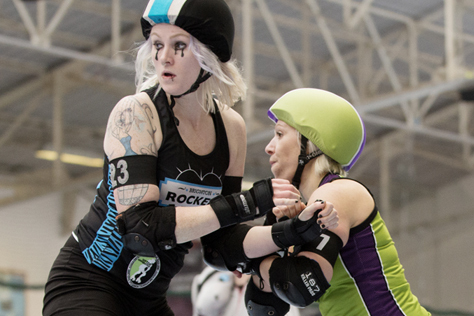 Issue 17 includes a super geeky feature on all the UK roller derby magazines ever. If you don’t like reading predictions before a game, jump right on past this here paragraph. A week or so back (Sun 30th Oct) the Rockers lost an away game to Luton’s Rebellion Roller Derby by a single point: 237-236. If Flattrackstats is to be believed, this Saturday’s action could well be just as close. The Brighton AllStars place 77th in Europe on 578.3 points, with Rockcity 81st on 568.5. FTS gives Brighton 63% chance of taking the win here with an expected differential of 44:37 suggesting a fairly narrow 176-148 margin. Moving onto the B-team game the Rockerbillies place 306th on 449.5 points. Usually we wouldn’t be able to predict a game involving a mixed team, but the opponents are so similarly ranked – Basingstoke 288th (455.1), Southampton 289th (454.4) – that the prediction comes out more or less the same whichever we use. Brighton are given a 51% chance of victory with a differential of 52:51 suggesting something like a 156-153 home win. Wowsers! This entry was tagged Basingstoke Bullets, Brighton Rockers, Haywards Heath, Rockcity Rollers, roller derby, roller skating, Southampton City Rollers, sport, women's sport.